Our well-known lightweight deflectometers TERRATEST 5000 BLU and TERRATEST 4000 STREAM for dynamical load plate test are presented in action during trade fair “Tiefbau Live”, taking place from 04/27 to 04/29 in Karlsruhe. The streaming method, enabling measurement results to be transferred on the construction site directly from the ROBUSTA electronics to a smartphone, is demonstrated in detail on our open-air stand T 222. By means of the TERRATEST® App, available from Google® Playstore without additional fee, these results can directly be sent to the office or to customers. “Tiefbau Live” is an important German trade fair for road construction and civil engineering, organized every 2 years in the proximity of Frankfurt, thus easy to reach for our international clientele. 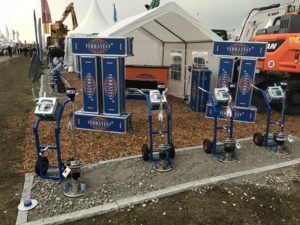 Due to large place available, numerous machines and devices used in building and construction industry are presented in the course of the event, running live in action. Usually 100 exhibitors are present, 15,000 visitors are expected. “For qualified compaction tests, our lightweight deflectometers more and more prove to be indispensable. So this trade fair is a good opportunity for possibly interested customers to familiarize themselves with its operating principle”, declares Frank G. Schulz, CEO of TERRATEST GmbH, Berlin.